This product is sourced in the United Kingdom and is intended for use in the United Kindgom only. Species: Cats, Dogs, Horses and other equidae, Ornamental birds, Reptiles, Small mammals Therapeutic indication: Pharmaceuticals: Neurological preparations: General anaesthetics Active ingredient: Isoflurane Product:IsoFlo® 100% w/w Inhalation Vapour, liquid Product index: IsoFlo 100% w/w Withdrawal notes: Horses (meat): 2 days. Not to be used for the treatment of mares producing milk for human consumption. 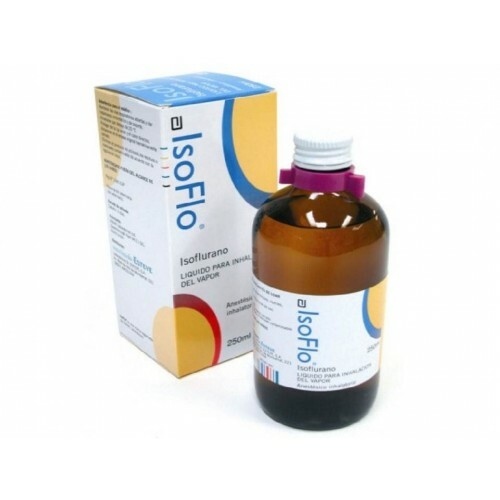 IsoFlo is an inhalation vapour, as liquid, containing 100% isoflurane per ml. Indicated for the induction and maintenance of general anaesthesia in horses, dogs, cats ornamental birds, reptiles, rats, mice, hamsters, chinchillas, gerbils, guinea pigs and ferrets. Isoflurane should be administered using an accurately calibrated vaporiser in an appropriate anaesthetic circuit, since levels of anaesthesia may be altered rapidly and easily. Isoflurane may be administered in oxygen or oxygen/nitrous oxide mixtures. The MAC (minimal alveolar concentration in oxygen) or effective dose ED50 values and suggested concentrations given below for the target species should be used as a guide or starting point only. The actual concentrations required in practice will depend on many variables, including the concomitant use of other drugs during the anaesthetic procedure and the clinical status of the patient. Isoflurane may be used in conjunction with other drugs commonly used in veterinary anaesthetic regimes for premedication, induction and analgesia. Some specific examples are given in the individual species information. The use of analgesia for painful procedures is consistent with good veterinary practice. Recovery from isoflurane anaesthesia is usually smooth and rapid. The analgesic requirements of the patient should be considered before the termination of general anaesthesia. Although anaesthetics have a low potential for damage to the atmosphere, it is good practice to use charcoal filters with scavenging equipment, rather than to discharge them into the air. The MAC for isoflurane in the horse is approximately 1.31%. Isoflurane may be used with other drugs commonly used in veterinary anaesthetic regimes. The following drugs have been found to be compatible with isoflurane: acepromazine, alfentanil, atracurium, butorphanol, detomidine, diazepam, dobutamine, dopamine, guiaphenesin, ketamine, morphine, pentazocine, pethidine, thiamylal, thiopentone and xylazine. Drugs used for premedication should be selected for the individual patient. However, the potential interactions below should be noted. Detomidine and xylazine have been reported to reduce the MAC for isoflurane in horses. As it is not normally practicable to induce anaesthesia in adult horses using isoflurane, induction should be by the use of a short acting barbiturate such as thiopentone sodium, ketamine or guiaphenesin. Concentrations of 3 to 5% isoflurane may then be used to achieve the desired depth of anaesthesia in 5 to 10 minutes. Isoflurane at a concentration of 3 to 5% in a high flow oxygen may be used for induction in foals. Anaesthesia may be maintained using 1.5% to 2.5% isoflurane. Recovery is usually smooth and rapid. The MAC for isoflurane in the dog is approximately 1.28%. Isoflurane may be used with other drugs commonly used in veterinary anaesthetic regimes. The following drugs have been found to be compatible with isoflurane: acepromazine, atropine, butorphanol, buprenorphine, bupivacaine, diazepam, dobutamine, ephedrine, epinephrine, etomidate, glycopyrrolate, ketamine, medetomidine, midazolam, methoxamine, oxymorphone, propofol, thiamylal, thiopentone and xylazine. Drugs used for premedication should be selected for the individual patient. However, the potential interactions below should be noted. Morphine, oxymorphone, acepromazine, medetomidine, medetomidine plus midazolam have been reported to reduce the MAC for isoflurane in dogs. The concomitant administration of midazolam/ketamine during isoflurane anaesthesia may result in marked cardiovascular effects, particularly arterial hypotension. The depressant effects of propanolol on myocardial contractility are reduced during isoflurane anaesthesia, indicating a moderate degree of β-receptor activity. Induction is possible by face mask using up to 5% isoflurane, with or without premedication. The MAC for isoflurane in the cat is approximately 1.63%. Isoflurane may be used with other drugs commonly used in veterinary anaesthetic regimes. The following drugs have been found to be compatible with isoflurane: acepromazine, atracurium, atropine, diazepam, ketamine, and oxymorphone. Drugs used for premedication should be selected for the individual patient. However, the potential interactions below should be noted. Intravenous administration of midazolam- butorphanol has been reported to alter several cardio-respiratory parameters in isoflurane- induced cats as has epidural fentanyl and medetomidine. Isoflurane has been shown to reduce the sensitivity of the heart to adrenaline (epinephrine). Induction is possible by face mask using up to 4% isoflurane, with or without premedication. Anaesthesia may be maintained using 1.5% to 3% isoflurane. Few MAC/ED50 values have been recorded. Examples are 1.34% for the Sandhill crane, 1.45% for the racing pigeon, reduced to 0.89% by the administration of midazolam, and 1.44% for cockatoos, reduced to 1.08% by the administration of butorphanol analgesic. The use of isoflurane anaesthesia has been reported for many species, from small birds such as zebra finches, to large birds such as vultures, eagles and swans. Propofol has been demonstrated in the literature to be compatible with isoflurane anaesthesia in swans. Butorphanol has been reported to reduce the MAC for isoflurane in cockatoos. Midazolam has been reported to reduce the MAC for isoflurane in pigeons. Induction: Induction with 3 to 5% isoflurane is normally rapid. Induction of anaesthesia with propofol, followed by isoflurane maintenance, has been reported for swans. The maintenance dose depends on the species and individual. Generally, 2 to 3% is suitable and safe. Only 0.6 to 1% may be needed for some stork and heron species. Up to 4 to 5% may be needed for some vultures and eagles. 3.5 to 4% may be needed for some ducks and geese. Generally, birds respond very rapidly to changes in concentration of isoflurane. Isoflurane is considered by several authors to be the anaesthetic of choice for many species. The literature records its use on a wide variety of reptiles (e.g. various species of lizard, tortoise, iguanas, chameleon and snakes). The ED50 was determined in the desert iguana to be 3.14% at 35°C and 2.83% at 20°C. No specific publications on reptiles have reviewed compatibilities or interactions of other drugs with isoflurane anaesthesia. Induction is usually rapid at 2 to 4% isoflurane. 1 to 3% is a useful concentration. Isoflurane has been recommended for anaesthesia of a wide variety of small mammals. The MAC for mice has been cited as 1.34%, and for the rat as 1.38%, 1.46% and 2.4%. No specific publications on small mammals have reviewed compatibilities or interactions of other drugs with isoflurane anaesthesia. Isoflurane concentration 2 to 3%. Isoflurane concentration 0.25 to 2%. Do not use in cases of known susceptibility to malignant hyperthermia. Do not use in cases of hypersensitivity to isoflurane. The metabolism of isoflurane in birds and small mammals can be affected by decreases in body temperature that may occur secondary to a high surface area to bodyweight ratio. Therefore body temperature should be monitored and kept stable during treatment. Drug metabolism in reptiles is slow and highly dependent upon environmental temperature. Reptiles may be difficult to induce with inhalation agents due to breath holding. The ease and rapidity of alteration of the depth of anaesthesia with isoflurane and its low metabolism, may be considered advantageous for its use in special groups of patients such as the old or young, and those with impaired hepatic, renal or cardiac function. Isoflurane has little or no analgesic properties. Adequate analgesia should always be given before surgery. The analgesic requirements of the patient should be reviewed again before the general anaesthesia has ended. Isoflurane causes depression of the cardiovascular and respiratory systems. It is important to monitor pulse quality and rate in all patients. The use of the product in patients with cardiac disease should only be considered after a benefit risk assessment by the responsible veterinary surgeon. In the case of cardiac arrest, complete cardio pulmonary resuscitation should be performed. Isoflurane produces hypotension and respiratory depression in a dose-related manner. Cardiac arrhythmias and transient bradycardia have been reported only rarely. Malignant hypothermia has been reported very rarely in susceptible animals. When using isoflurane to anaesthetise an animal with a head injury, consideration should be given as to whether artificial ventilation is appropriate to maintain normal CO2 levels, so that cerebral blood flow does not increase. The frequency of adverse reactions is defined using the following convention: - very common (more than 1 in 10 animals displaying adverse reaction(s) during the course of one treatment) - common (more than 1 but less than 10 animals in 100 animals) - uncommon (more than 1 but less than 10 animals in 1,000 animals) - rare (more than 1 but less than 10 animals in 10,000 animals) - very rare (less than 1 animal in 10,000 animals, including isolated reports). Isoflurane overdose may result in profound respiratory depression. Therefore, respiration must be monitored closely and supported when necessary with supplementary oxygen and/or assisted ventilation. In cases of severe cardiopulmonary depression, administration of isoflurane should be discontinued, the breathing circuit should be flushed with oxygen, the existence of a patent airway ensured, and assisted or controlled ventilation with pure oxygen initiated. Cardiovascular depression should be treated with plasma expanders, pressor agents, antiarrhythmic agents or other appropriate techniques. Pregnancy: Use only according to the benefit/risk assessment by the responsible veterinarian. Isoflurane has been safely used for anaesthesia during caesarean section in the dog and cat. Lactation: Use only according to the benefit/risk assessment by the responsible veterinarian. Horses (meat): 2 days. Not to be used for the treatment of mares producing milk for human consumption. Do not breathe the vapour. Users should consult their National Authority for advice on Occupational Exposure Standards for isoflurane. Operating rooms and recovery areas should be provided with adequate ventilation or scavenging systems to prevent the accumulation of anaesthetic vapour. All scavenging/extraction systems must be adequately maintained. Pregnant and breast-feeding women should not have any contact with the product and should avoid operating rooms and animal recovery areas. Avoid using masking procedures for prolonged induction and maintenance of general anaesthesia. Use cuffed endotracheal intubation when possible for the administration of IsoFlo during maintenance of general anaesthesia. Care should be taken when dispensing isoflurane, with any spillage removed immediately using an inert and absorbent material e.g. sawdust. Wash any splashes from skin and eyes, and avoid contact with the mouth. If severe accidental exposure occurs remove the operator from the source of exposure, seek urgent medical assistance and show this label. Halogenated anaesthetic agents may induce liver damage. In case of isoflurane this is an idiosyncratic response very rarely seen after repeated exposure. Advice to Doctors: Ensure a patent airway and give symptomatic and supportive treatment. Note that adrenaline and catecholamines may cause cardiac dysrhythmias. Do not store above 25°C. Store in the original bottle. Keep the bottle tightly closed. Protect from direct sunlight and heat. Any unused product or waste materials should be disposed of in accordance with national requirements. Keep out of the sight and reach of children. For animal treatment only. Supplied in Type III amber glass bottles containing 100 or 250 ml. Not all pack sizes may be marketed. Isoflurane has been reported to interact with dry carbon dioxide absorbents to form carbon monoxide. In order to minimise the risk of formation of carbon monoxide in rebreathing circuits and the possibility of elevated carboxyhaemoglobin levels, carbon dioxide absorbents should not be allowed to dry out. The action of muscle relaxants in man, especially those of the non-depolarising (competitive) type such as atracurium, pancuronium or vecuronium, is enhanced by isoflurane. Similar potentiation might be expected to occur in the target species, although there is little direct evidence to this effect. Concurrent inhalation of nitrous oxide enhances the effect of isoflurane in man and similar potentiation might be expected in animals. The concurrent use of sedative or analgesic drugs is likely to reduce the level of isoflurane required to produce and maintain anaesthesia. Isoflurane has a weaker sensitising action on the myocardium, to the effects of circulating dysrhythmogenic catecholamines, than halothane. Isoflurane should be administered using an accurately calibrated vaporiser in an appropriate anaesthetic circuit, since levels of anaesthesia may be altered rapidly and easily. Isoflurane may be administered in oxygen or oxygen/nitrous oxide mixtures. The MAC (minimal alveolar concentration in oxygen) or effective dose ED50 values and suggested concentrations given below for the target species should be used as a guide or starting point only. The actual concentrations required in practice will depend on many variables, including the concomitant use of other drugs during the anaesthetic procedure and the clinical status of the patient. Isoflurane may be used in conjunction with other drugs commonly used in veterinary anaesthetic regimes for premedication, induction and analgesia. Some specific examples are given in the individual species information. The use of analgesia for painful procedures is consistent with good veterinary practice. Recovery from isoflurane anaesthesia is usually smooth and rapid. The analgesic requirements of the patient should be considered before the termination of general anaesthesia. Although anaesthetics have a low potential for damage to the atmosphere, it is good practice to use charcoal filters with scavenging equipment, rather than to discharge them into the air. As it is not normally practicable to induce anaesthesia in adult horses using isoflurane, induction should be by the use of a short acting barbiturate such as thiopentone sodium, ketamine or guiaphenesin. Concentrations of 3 to 5% isoflurane may then be used to achieve the desired depth of anaesthesia in 5 to 10 minutes. Isoflurane at a concentration of 3 to 5% in a high flow oxygen may be used for induction in foals. Morphine, oxymorphone, acepromazine, medetomidine, medetomidine plus midazolam have been reported to reduce the MAC for isoflurane in dogs. The concomitant administration of midazolam/ketamine during isoflurane anaesthesia may result in marked cardiovascular effects, particularly arterial hypotension. The depressant effects of propanolol on myocardial contractility are reduced during isoflurane anaesthesia, indicating a moderate degree of β-receptor activity. Few MAC/ED50 values have been recorded. Examples are 1.34% for the Sandhill crane, 1.45% for the racing pigeon, reduced to 0.89% by the administration of midazolam, and 1.44% for cockatoos, reduced to 1.08% by the administration of butorphanol analgesic. The use of isoflurane anaesthesia has been reported for many species, from small birds such as zebra finches, to large birds such as vultures, eagles and swans. Propofol has been demonstrated in the literature to be compatible with isoflurane anaesthesia in swans. Butorphanol has been reported to reduce the MAC for isoflurane in cockatoos. Midazolam has been reported to reduce the MAC for isoflurane in pigeons. Induction: Induction with 3 to 5% isoflurane is normally rapid. Induction of anaesthesia with propofol, followed by isoflurane maintenance, has been reported for swans. The maintenance dose depends on the species and individual. Generally, 2 to 3% is suitable and safe. Only 0.6 to 1% may be needed for some stork and heron species. Up to 4 to 5% may be needed for some vultures and eagles. 3.5 to 4% may be needed for some ducks and geese. Generally, birds respond very rapidly to changes in concentration of isoflurane. Isoflurane is considered by several authors to be the anaesthetic of choice for many species. The literature records its use on a wide variety of reptiles (e.g. various species of lizard, tortoise, iguanas, chameleon and snakes). The ED50 was determined in the desert iguana to be 3.14% at 35°C and 2.83% at 20°C. Do not use in cases of known susceptibility to malignant hyperthermia. Do not use in cases of hypersensitivity to isoflurane. The metabolism of isoflurane in birds and small mammals can be affected by decreases in body temperature that may occur secondary to a high surface area to bodyweight ratio. Therefore body temperature should be monitored and kept stable during treatment. Drug metabolism in reptiles is slow and highly dependent upon environmental temperature. Reptiles may be difficult to induce with inhalation agents due to breath holding. The ease and rapidity of alteration of the depth of anaesthesia with isoflurane and its low metabolism, may be considered advantageous for its use in special groups of patients such as the old or young, and those with impaired hepatic, renal or cardiac function. Isoflurane has little or no analgesic properties. Adequate analgesia should always be given before surgery. The analgesic requirements of the patient should be reviewed again before the general anaesthesia has ended. Isoflurane causes depression of the cardiovascular and respiratory systems. It is important to monitor pulse quality and rate in all patients. The use of the product in patients with cardiac disease should only be considered after a benefit risk assessment by the responsible veterinary surgeon. In the case of cardiac arrest, complete cardio pulmonary resuscitation should be performed. Isoflurane produces hypotension and respiratory depression in a dose-related manner. Cardiac arrhythmias and transient bradycardia have been reported only rarely. Malignant hypothermia has been reported very rarely in susceptible animals. When using isoflurane to anaesthetise an animal with a head injury, consideration should be given as to whether artificial ventilation is appropriate to maintain normal CO2 levels, so that cerebral blood flow does not increase. Isoflurane overdose may result in profound respiratory depression. Therefore, respiration must be monitored closely and supported when necessary with supplementary oxygen and/or assisted ventilation. In cases of severe cardiopulmonary depression, administration of isoflurane should be discontinued, the breathing circuit should be flushed with oxygen, the existence of a patent airway ensured, and assisted or controlled ventilation with pure oxygen initiated. Cardiovascular depression should be treated with plasma expanders, pressor agents, antiarrhythmic agents or other appropriate techniques. Pregnancy: Use only according to the benefit/risk assessment by the responsible veterinarian. 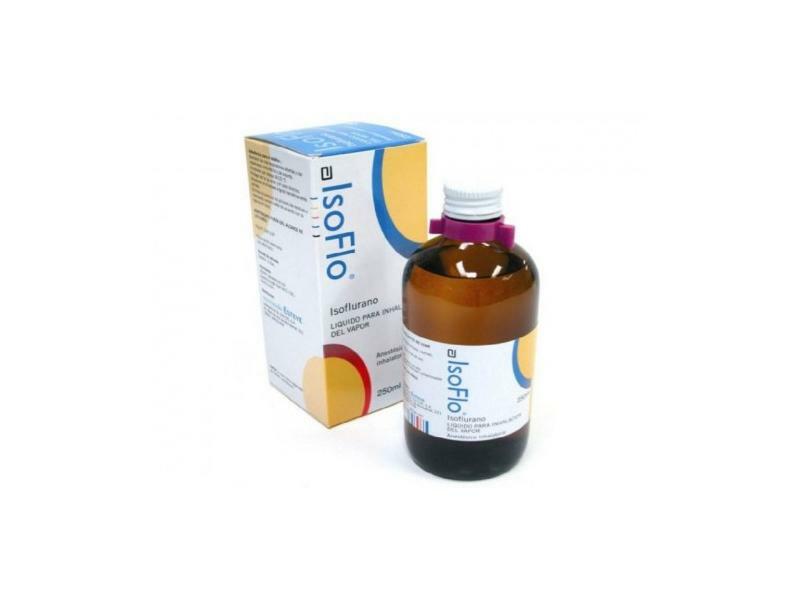 Isoflurane has been safely used for anaesthesia during caesarean section in the dog and cat. Lactation: Use only according to the benefit/risk assessment by the responsible veterinarian. Do not breathe the vapour. Users should consult their National Authority for advice on Occupational Exposure Standards for isoflurane. Operating rooms and recovery areas should be provided with adequate ventilation or scavenging systems to prevent the accumulation of anaesthetic vapour. All scavenging/extraction systems must be adequately maintained. Pregnant and breast-feeding women should not have any contact with the product and should avoid operating rooms and animal recovery areas. Avoid using masking procedures for prolonged induction and maintenance of general anaesthesia. Use cuffed endotracheal intubation when possible for the administration of IsoFlo during maintenance of general anaesthesia. Care should be taken when dispensing isoflurane, with any spillage removed immediately using an inert and absorbent material e.g. sawdust. Wash any splashes from skin and eyes, and avoid contact with the mouth. If severe accidental exposure occurs remove the operator from the source of exposure, seek urgent medical assistance and show this label. Halogenated anaesthetic agents may induce liver damage. In case of isoflurane this is an idiosyncratic response very rarely seen after repeated exposure. Advice to Doctors: Ensure a patent airway and give symptomatic and supportive treatment. Note that adrenaline and catecholamines may cause cardiac dysrhythmias. Store in the original bottle. Keep the bottle tightly closed. Protect from direct sunlight and heat. Any unused product or waste materials should be disposed of in accordance with national requirements. Isoflurane has been reported to interact with dry carbon dioxide absorbents to form carbon monoxide. In order to minimise the risk of formation of carbon monoxide in rebreathing circuits and the possibility of elevated carboxyhaemoglobin levels, carbon dioxide absorbents should not be allowed to dry out. The action of muscle relaxants in man, especially those of the non-depolarising (competitive) type such as atracurium, pancuronium or vecuronium, is enhanced by isoflurane. Similar potentiation might be expected to occur in the target species, although there is little direct evidence to this effect. Concurrent inhalation of nitrous oxide enhances the effect of isoflurane in man and similar potentiation might be expected in animals. The concurrent use of sedative or analgesic drugs is likely to reduce the level of isoflurane required to produce and maintain anaesthesia. Isoflurane has a weaker sensitising action on the myocardium, to the effects of circulating dysrhythmogenic catecholamines, than halothane. There are currently no questions for IsoFlo 100% w/w Inhalation Vapour, liquid - be the first to ask one!